This old Monier Tile roof was losing it’s glazing coat and starting to leak. The homeowner was also going to install solar so she wanted the underlying roof to be sound. Leakmaster pressure cleaned off the old pigment, then sprayed a coat of NXT Primer to seal in the tiles. The white coating you see on the top of the roof (the ridge) is a butter grade roofing sealant that we use to waterproof the tiles, and keep the cement grouting from popping out. This is a common source of leaks in older Monier roofs. Then we finished with two top coats of NXT Cool Coat. It is the only roof coating that we use on Monier tiles. It is made with especially durable tints that reflect UV rays and keep the home cool, even with darker colors. Ordinary house paints will peel off, and elastomeric coatings, including silicones, are not allowed by Monier on their roofs because they can block up the keyways, and cause leaks. This asphalt shingle roof was in terrible condition. Leakmaster had to take immediate action and use Peel and Stick Roof Tape along the perimeter to keep the shingles from blowing off. We then replaced missing shingles and coated everything with Cool Roof Store Super Roof Primer. As a topcoat, we applied 2 top coats of NXT Cool Coat. Which is a highly reflective acrylic top coat with special UV tints that keep your home cool, even with dark colors. In this case, they chose a bright white, which is always the most reflective choice. It lowered the roof temperatures by 70 degrees, which made interior temperatures much more comfortable. This roof was particularly difficult because of its 25 skylights. They were leaking at the curbings so Leakmaster reinforced them with Roof Tape. Then, we coated the whole roof with CRS Waterproofing Roof Primer. It’s the only roof primer that stops leaks as well as bleed through from asphalt. It also smooths out the granular roof surface so that it can be topcoated with Silicone, which does not soak into the old dry cap sheet roof. Since the shingle roof is located in a high wind area, as are most of Honolulu’s ridge top homes, we screwed an aluminum termination bar on the edge of the shingles to protect the shingles from blowing off. This flat roof was previously coated with a water-based coating, similar to Cool Roof Store Ceramic. LeakMaster Roofing’s main objective was to install a new layer of High Solid NXT Silicone. Before we could apply the top coat, it was important to pressure wash and thoroughly remove any loose debris, dirt and mildew from the roof. Once we began installing the high solid silicone coating, we also need to address the asphalt shingle roof tie in connected to the flat roof. We removed two layers of shingles to coat underneath and installed new shingles to properly address the tie in. Familiar with roof coatings, it was time for a recoat. The problem with water-based acrylic coatings is their life span is short. Most high grade water-based roof coatings tend to chalk away and eventually erode due to the elements after 5-7 years. In comparison, silicone roof coatings last up to 20-30 years without a recoat. 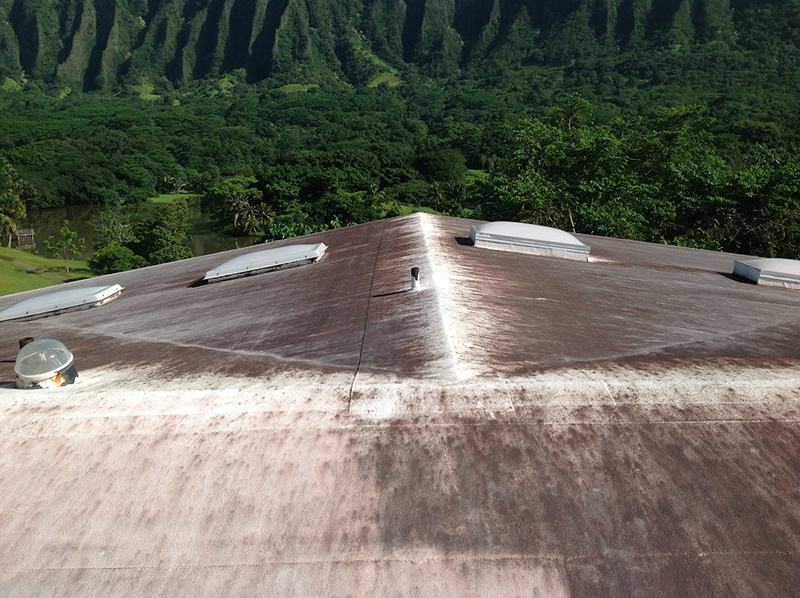 Once the roof was thoroughly cleaned LeakMaster installed APOC Armor Flex high solid silicone.